Mako sharks are built to move. They are very acrobatic – sometimes leaping high into the air –and are also extremely fast. Some scientists think they are the fastest fish, possibly going over 50 mph at times. (Fun fact – makos are one of the only “warm-blooded” fish, which helps explain why they can move so fast, even in colder water.) Makos need wide open spaces and healthy places to eat and reproduce. The health of our oceans depends on healthy top predator populations, and healthy top predators depend on healthy oceans. Our nation has taken a major step forward in protecting the health of our oceans with the National Ocean Policy – which calls better management through agency coordination, science-based decisions and robust public and stakeholder involvement. One important priority of the National Ocean Policy is to protect ocean habitat and wildlife while supporting sustainable new and traditional uses of our ocean. Regional ocean planning and ecosystem-based management are two other key components of the National Ocean Policy that can go a long way in protecting our top predators. Regional ocean planning is a process that brings together all our ocean stakeholders – from fishermen to whale watchers, from beachgoers to renewable energy developers – to help us figure out how to share the ocean sustainably. This process helps all New Englanders use and enjoy our ocean and coasts while making sure we protect ocean wildlife and habitats and maintain the benefits these resources provide for us all. For an example of how regional ocean planning can protect marine wildlife, check out this blog about endangered North Atlantic right whales and shipping lanes. Collecting and sharing good data, and using it to help make ocean management decisions, are some of the keys to succesful regional ocean planning. If you are wondering how this might apply to mako sharks, check out this app from NOAA that allows fishermen to share information about caught and released makos – to literally put that shark on the map. NOAA says “Overfishing is occurring on the North Atlantic shortfin mako shark population. 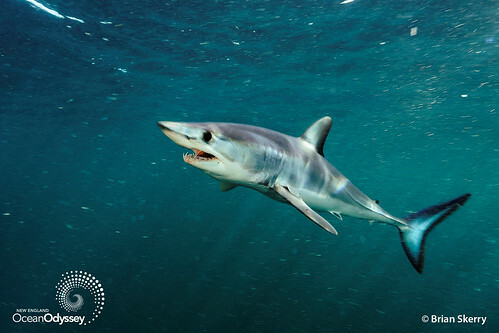 By releasing shortfin mako sharks that are unintentionally caught or caught for sport, fishermen can lead the way for conserving this shark species.” Now that sounds like some good planning.